Our Education and Outreach departments are in need of four interns for the summer of 2016. Interns will be responsible for assisting the education & outreach staff in teaching our hands-on science programs. 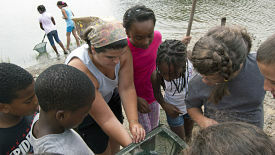 The Lloyd Center’s educational philosophy is that hands-on experiential learning brings the study of science to life. Through this approach, students develop and retain knowledge of how the environment works and an appreciation for the need to conserve natural areas. Our Research department has two openings for seasonal internships for survey, protection and monitoring of the endangered piping plover on beaches owned by the Massachusetts Department of Conservation and Recreation in Bristol County (Horseneck, Demarest Lloyd, Gooseberry, and West Island). The Lloyd Center may be conducting inventories (pending grant awards) of barrens and other habitats across Massachusetts focusing on Lepidoptera (particularly moths), but involving other orders as well. Inventory work is conducted by setting out light traps at night and retrieving them the following morning. Click here to learn more about internship opportunities at the Lloyd Center.